PASSED! 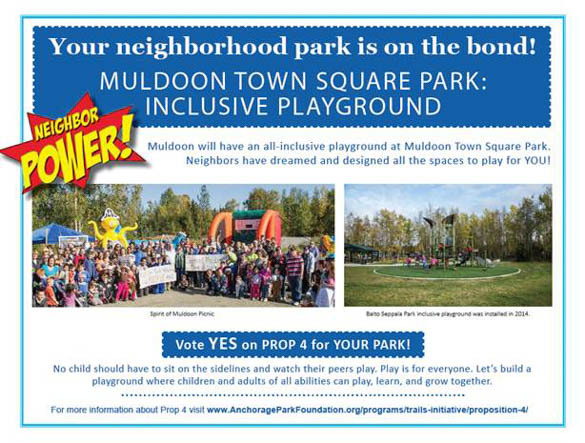 The Parks Bond includes funds for an all-inclusive playground at Muldoon Town Square Park, Muldoon Road at DeBarr – at the location planned for Muldoon Farmers Market starting in 2017. A destination playground will be a big draw for the farmers market and the park. 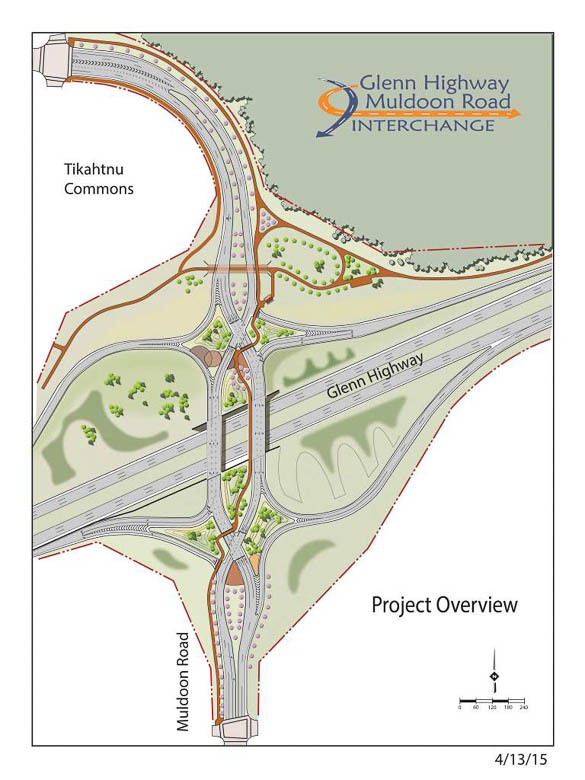 Glenn Highway Muldoon Road Interchange Public Open House 6:30-8 p.m. Wednesday, March 16, 2016, informal presentation at 7 p.m., in the Yellow Cafeteria at Bartlett High School, 1101 North Muldoon Road. Project teams will be available to review the scope of work and provide information about the project. Go to www.glennmuldoon.com to “drive” through the new interchange via animation video. Come, learn about Diverging Diamond Interchange design plans for vehicles, bicycles, pedestrians and share your opinions and concerns with DOT&PF. Neeser Construction Inc. has been selected to construct the Glenn Muldoon DDI. Work will begin in the Spring of 2016, continue over three seasons, and be completed by November 2018. 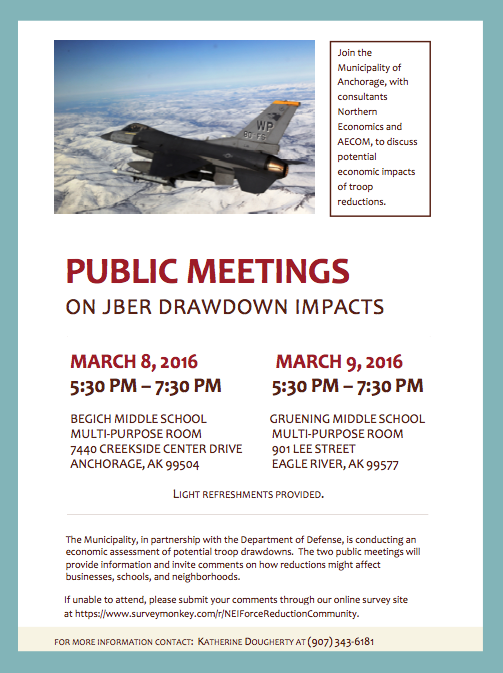 First Public Meeting on JBER Drawdown Impacts 5:30-7:30 p.m. Tuesday, March 8, in the multi-purpose room at Begich Middle School, 7440 Creekside Center Drive. Light refreshments provided. The Municipality, in partnership with the Department of Defense, is conducting an economic assessment of potential troop drawdowns. Two public meetings will provide information and invite comments on how reductions might affect businesses, schools, and neighborhoods. If unable to attend, please submit your comments through our online survey site at https://www.surveymonkey.com/r/NEIForceReductionCommunity.